For nonprofits that rely on volunteers to further their mission, robust volunteer engagement and management processes and systems are essential to scaling impact without scaling costs dollar for dollar. Lean processes reduce ambiguity and save staff trips down rabbit holes in their day-to-day operations. Strong systems enable staff to focus on activities that warrant their skills and intellect by reducing the volume of busy work. If you’re embarking upon a journey to streamline your organization’s volunteer management processes, consider the following five-phase approach to derive real, tangible outcomes from your process improvement initiative. These insights are based on an engagement with a national nonprofit operating in 23 states that sought to scale their systems and processes to allow for a five-fold increase in constituents served. In an operations internship at an Amazon Customer Service center in the summer of 2013, my on-boarding included the ever-so-important Associate Experience Week, a ritual that every managerial hire would go through to get a first-hand experience of the work done by front-line staff. The AEW allowed new hires to build a sense of what was working well on the floor and what wasn’t, and more importantly, allowed them to build empathy with the trials and tribulations, and joys of the people they would be managing. Experiencing your volunteer management processes in the first person is critical to identifying meaningful areas for improvement. Start with developing a deep understanding of those processes. There’s no better place to do that than shadowing individuals where the good work is done, whether that’s out on the field or at their desks. If you’re a former front-line employee that moved up in your organization some time ago (or joined the organization mid-career and never did front-line work there) chances are that the day-to-day details of your volunteer management processes may have become unfamiliar to you. It’s time to update your understanding. As you listen and learn from your staff, map out your volunteer management processes (recruiting volunteers, onboarding and background checks, sign-ups and communication, and so on) through process maps. Use large easel pads sheets, post-its, sharpies so that you can circulate these process maps in your organization (hang them on the walls). By making your process maps available in a transparent way, you can allow your staff to point out exceptions/variations that they may be dealing with without your knowledge, variations that may be impacting the efficiency of your process or the experience of your volunteers in ways you couldn’t have imagined. The first step in solving a problem is recognizing it! Unless you’re Alexander the great, you are not going to conquer the world in one lifetime. (Frankly, if Young Alex possessed Google Maps, he would’ve realized that even he didn’t quite conquer the world). In other words, do not expect to conquer all of your organization’s challenges in this one initiative. After you’ve mapped out your processes, documented every step and discovered more opportunities for improvement than you could wrap your head around, your next challenge would be to make your plate at the buffet of inefficiencies. Your instinct would be to gather your team and “prioritize”. Consider it a pet peeve of mine, but when it comes to strategizing, few words make me cringe more than “Let’s prioritize.” In theory, “prioritizing” is the simple process of ranking needs in decreasing order of importance with complete and total alignment among those who are participating in the process. In reality, it can quickly devolve into an experiment in determining who in the room has more organization-wide influence, who holds more sway in decision making, who can make a more convincing argument irrespective of the facts (real or alternative), who is most entrenched in their ways and so on. Instead of prioritize, I recommend that you pragmatize. First, remove from consideration areas of opportunity that would be constrained by factors that are beyond the control of you (or your team). If you feel that a major impediment in recruiting new volunteers is insufficient efforts from the Communications team, but you don’t run or work in the communications department, that’s probably one item out of consideration. Ask yourselves, “What do we have the mandate to accomplish?” Tap into your understanding of your organization to weed out projects that are likely to run into roadblocks and fall to the wayside. With what all is left, examine the value-add that each is like to generate. It’s tempting to go with projects that could increase the likelihood of bringing in more earned revenue or securing a grant, but the value can be created in many shapes and forms. In your situation, the best ROI could be in the form of alleviating major pain points or improving the satisfaction of your volunteer coordinators who are deadly tired of working off of Google spreadsheets and can’t wait to find another job at another nonprofit with actual systems. It could be a project that could improve the experience of existing volunteers so that they become sticky, and you’re not always on the hunt for new volunteer faces to replace old ones. As you have these discussions, create a parking lot where you can park ideas that are great ideas in and of themselves but are unlikely to fall within the scope of your current initiatives and instead likely to move the current conversation onto tangents. Once those process maps are adorning the walls of your office and you’ve narrowed down on specific parts of your volunteer management processes to address, it’s time to carry out my favorite exercise: the asking of the “Five Whys”. That’s just the first why though. As you answer the first Why, you immediately counter that answer with another Why. And then you repeat that till you drill five levels deep. The goal is to validate that each step in the process is intentional, meaningful, carried out in the most efficient manner and carried out at the right point in time. If you’re sitting in a room with veterans of your organization, it’d be easy to breeze through the Five Whys. Every step is likely to seem necessary, properly executed and well-timed. Why wouldn’t it… it’s your baby after all! This is where it becomes extremely valuable to bring in an outsider’s perspective… someone who is inquisitive and isn’t familiar with (and doesn’t have an emotional attachment to) your processes. Consider yourself lucky if you can bring someone to the room with perspective on how other organizations (which could be other nonprofits, for-profits, governmental organizations etc.) carry out activities similar to yours in different ways. This person may be in the form of a (very) recent outside hire, a consultant, a counterpart at another local nonprofit, etc. You want to come out of this process with a new process map which, if all goes well, looks at least somewhat different from the status quo. If the new process map looks far too similar to the prior map, it means that either your existing processes are close to perfection (which is unlikely, because there’s always room for improvement and innovation) or you didn’t ask enough Why’s. As you examine and streamline your internal volunteer management processes, you want to simultaneously examine and document your volunteer experience, i.e. the interactions that your volunteer has with your organization, whether it’s interactions with your staff, your website/volunteer management system, the electronic communication (email, text) that they receive and so on. Studying and streamlining the end-user experience is in my opinion, among the most overlooked areas in for-profit and nonprofit organizations alike. 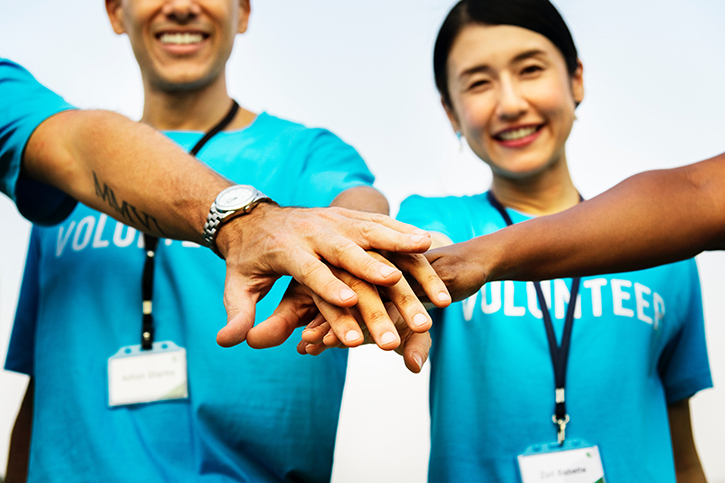 Creating pleasant, unambiguous interactions between you and your volunteers can go a long way in making them feel connected to your organization and its mission, and therefore, making them sticky. Service Blueprinting is an excellent method for systematically analyzing and documenting an “experience”, something that can generally be considered fairly intangible. In a nutshell, a service blueprint seeks to document internal processes at a high level, while capturing internal-external interactions in rich detail. If you’re keen to explore and looking to get started on Service Blueprinting, the Center for Services Leadership at Arizona State University (my alma mater) excels at training organizations big and small on how to blueprint their services and customer interactions, but the treasure trove called the internet holds a few good examples worth looking at and emulating. Grand initiatives, such as transforming your volunteer management processes, can be fun, appealing, energizing, and can motivate your staff to come together, contribute and create tremendous value for your organization. That is until the next grand initiative comes along and the focus, energy, investment and enthusiasm shifts in its direction. A well-planned and well-executed change management process doesn’t only deliver tremendous value in the now but creates improvements that are long-lasting and self-sustaining. However, creating that “sustainability” factor needs to be built into the scope and design of your project, and not left to an expectation that your staff will follow the new recommendations you put before them. As humans, we are all creatures of habit and can be quick to resort to our established ways, especially when we feel like no one is looking. A sure way of holding people accountable for adopting change is, again, by creating transparency. Whatever process, technology, automation or metrics you decide to put in place as you seek to transforming your volunteer management processes, ensure that you identify success indicators that you care about (# volunteer opportunities per month, # of sign-ups per opportunity, # RSVPs and % of no-shows, # of repeat/returning volunteers), and ensure that the systems you adopt can report on these indicators in an automated way, or with minimal effort. Then, ensure that those metrics are made available on-demand or on a set schedule to the entire organization. The key takeaway: A successful process improvement initiative in your volunteer management department can do wonders for streamlining your operations, increasing volunteer engagement and providing your employees with an opportunity to learn and grow. Just be sure to focus on the benefits to your internal and external customers while surrounding yourself with those who will hold your feet to the fire. Driven by a passion to bring for-profit expertise to nonprofits & small businesses, Dhruv brings to Urgensee experience in lean operations, customer service, product management, and business analytics. Dhruv’s past work experience includes roles at Microsoft, Amazon and Reasoning Mind. Dhruv is an advocate of the Salesforce platform for the opportunities it opens for smaller organizations to create robust processes, make data-driven decisions and deliver memorable customer experiences. Dhruv holds an MBA in Finance and Marketing, and an MS in Information Management.